Be the first to share your favorite memory, photo or story of Opal. This memorial page is dedicated for family, friends and future generations to celebrate the life of their loved one. Opal Parrish Gibson, age 104, passed peacefully from this world to her heavenly home on February 5, 2019, with her family around her. Opal was raised in a Christian home the daughter of Herman Parrish and Georgia Mefford Parrish. She grew up in the community of Peaks Mill with 3 brothers and 2 sister. She was the widow of Willard Gibson. She is survived by her children, Ann Roberts Simmons and H.S. (Gippy) Gibson (Angie). She has 7 grandchildren, Tom Roberts (Julie), Phil Roberts, Kathy Watkins (Glenn), Michael Gibson (Janna), Clay Gibson (Amy), Jared Gibson, and Joseph Palmer; and 8 great grandchildren. She is also survived by her sister, Mary Edna Bondurant, and numerous nieces and nephews. Opal started teaching school at Peaks Mill and retired after 36 years. 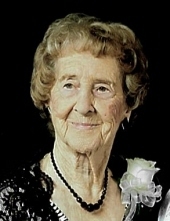 Still known as “Miss Opal” to her former students. Still active after retirement, she worked part time in state and county government offices and the Kathryn Shoppe. She was a life-long member of Peaks Mill Christian Church from childhood, Altrusa Club and several service clubs. Visitation will be Friday, February 8, 2019 from 4:00pm until 8:00pm at Clark Legacy Center, Versailles Rd and Saturday, February 9, 2019 from 10:00am until 11:30am at Peaks Mill Church with services to follow conducted by Bro. Ronnie McKinney. Burial will be at Peaks Mill Cemetery. Serving as casketbearers will be Tom Roberts, Phil Roberts, Glenn Watkins, Michael Gibson, Clay Gibson, and Jared Gibson. Flowers are appreciated or donations in her memory to the charity of your choice. To send flowers or a remembrance gift to the family of Opal Parrish Gibson, please visit our Tribute Store. "Email Address" would like to share the life celebration of Opal Parrish Gibson. Click on the "link" to go to share a favorite memory or leave a condolence message for the family.